Wigan Warriors made a piece of unwanted Super League history at the DW Stadium. Oliver Gildart's try with 80 seconds to go locked the score 22-22 and, with Zak Hardaker unable to convert after the siren, it sent the match into golden-point - the first regular season match to be settled by the new rule. Mark Sneyd's drop-goal decided the contest before Wigan had touched the ball, snapping FC's 13-game losing run which stretched back to June. 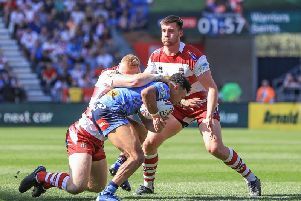 It was certainly a dramatic finish to a seesawing game which left the Warriors on zero points on the table after three rounds - their points deduction scrubbed off the gains from their sole victory of the season, against Leeds. And while this could easily have gone their way - each side scored four tries - they will lament certain areas of their performance, particularly a sloppy defence which allowed Hull FC to chew up the metres with ease during their purple-patch. Their defence on the edges was at times frail, and with the ball they didn't pose enough questions. Those seeking positives can look to a try-scoring debut for Liam Byrne and an energetic display from Jarrod Sammut, who sent Ben Flower over for the try which set-up a grandstand finish to the regular, 80-minutes. As well as those two, Taulima Tautai made his first appearance of the season. FC were missing seven senior players through either injury or suspension - a situation which prompted Lee Radford to bring Gareth Ellis, their rugby director, out of retirement. Lam had set his players the goal of scoring first in the match, something they achieved when - after a scrappy opening - Hardaker sent Gildart over and then tagged on the extras to make it 6-0. It all seemed to be going well for Wigan but it soon unravalled, as their opponents racked up three tries without reply. Hull FC were much better than advertised, particularly through the scheming Jake Connor and the slippery Jamie Shaul, but they were helped all the way by Warriors' slack defensive effort. First, Carlos Tuimavave crossed in the corner and moments later Joe Westerman impersonated Henry Paul, doing a full spin before going over under the sticks. With Sneyd striking one of the two conversions, FC took a 10-6 lead. Wigan's attack fared little better than their defence, with messy ends to their sets. Connor's superb cut-out pass to touch down. Shaul's boot opened up a 10-point margin. Byrne marked his debut with a try, collecting Sam Powell's short, stabbed kick and diving over. Hardaker's conversions reeled in the margin to four points. Wigan lost Joe Greenwood to a head injury and then his replacement, Tautai, was sinbinned just before half-time for a dangerous tackle. And while the Warriors were down to 12 men, FC extended their lead, stretching the line for Naulago to score his second. They appeared energised by their lead. Wigan, on the other hand, seemed rattled. O'Loughlin was brought on to galvanise the squad and, despite a couple of errors from Tautai, they regained some composure. With 15 minutes to go, Sammut's short pass send Flower trucking over - incredibly, he has scored in all three of Wigan's Super League games this season. Hardaker's conversion made it 18-22 and set the stage for a tense finish. O'Loughlin was held up as FC absorbed repeat raids on their line - until Gabe Hamlin's piercing break eventually led to Gildart, who opened the scoring, arcing over to finish the 80 minutes with a try which locked the scores. Hardaker's conversion-attempt was just wide - some celebrated prematurely, thinking it had gone over - to send the match into golden-point. But a penalty piggybacked FC out of their own half, and Sneyd struck the decisive drop-goal. Lam takes his Wigan side to London Broncos next Sunday. Wigan: Hardaker; Davies, Gildart, Sarginson, Marshall; Williams, Leuluai; Bullock, Powell, Flower, Greenwood, Isa, O'Loughlin. Subs: Tautai, Byrne, Hamlin, Sammut. Hull FC: Shaul; Naulago, Tuimavave, Griffin, Faraimo; Connor, Sneyd; Paea, Houghton, Motongo, Manu, Minichiello, Westerman. Subs: Ellis, Thompson, Lane, Litten.